Oran Kearney joked he was ‘absolutely wrecked’ after watching Coleraine’s dramatic win over Glenavon on Saturday. And who could blame the Bannsiders boss? As games go it was a real Christmas cracker. It had everything - spectacular goals, controversial decisions and a dramatic finale. It was that frantic finish which had Kearney and everyone else at Mourneview Park struggling to catch their breath. With Coleraine deservedly leading 2-1 thanks to goals from Neil McCafferty and Shane McGinty, Glenavon were handed the chance to grab a point as Keith Kennedy harshly penalised Stephen Douglas for handball with minutes to go. The Bannsiders were rightly aggrieved by the controversial decision but it gave Eoin Bradley the opportunity to level the game. His initial save was superbly saved by Michael Doherty but the rebound fell nicley for the former Coleraine man a yard from goal and he fired home. Remarkably though some 38 seconds Coleraine were back in front again, and what a goal it was! From the restart Neil McCafferty pinged a pin point pass over Gareth McKeown’s head, Ian Parkhill took the ball in his stride and coolly finished under James McGrath to set off wild celebrations amongst the Coleraine players and travelling support. Such was the drama it took the majority of fans inside the ground sevral moments to realise David Ogilby had in fact been sent off for his celebration. The Bannsiders held on though to leapfrog Glenavon into the top six and leave Kearney a happy, if not exhausted, man at the end. “My emotions are all over the place at the minute to be honest in relation to the manner of the game and obviously with the frantic finish,” Kearney told Times Sport at the end. “I thought we had done enough to see the game out and then got a penalty, which a lot of our lads feel aggrieved about. We were thinking it’s another one which has gone against us and it was two points dropped. “But to be fair to our lads they go straight up the pitch and score the winner. “It was a fantastic ball by Neil McCafferty, but the take and finish from Ian is absolute quality and it is a big, big three points for us. “When we conceded the equaliser so late I was trying to get the lads to focus again because of the frustration of the manner of the penalty, because their emotions were all over the place at that stage. “I was trying to get the message across to them not to do anything silly which would allow them to go straight back up the pitch and score the winner. You see that happening all the time, the team which gets the equaliser gets a bit of momentum with the goal. “Today though it has proved the opposite we have grabbed the momentum again and gone on to get the winner. The three goals Coleraine scored on the day were all quality finishes and Kearney was quick to praise the scorers. “To be fair to Ian I thought his performance today merited a goal,” said the Bannsiders boss. “He worked his socks off all day, he was a fantastic outlet for us. So I was delighted to see him pop up with such a vital goal. He is a really good finisher and he proved that today. “We have a real sweat on every time we win a free kick anywhere near the opponents’ box now. Neil hit another great free kick in the second half which was blocked by the wal, but he caught it really well. “But the goal he scored was another superb strike, and he has been doing that all season to be fair to him. “The goal last week did Shane the world of good, he’s starting to feel more confident. We just asked him for the same freedom in his performance today again. “There was weeks gone past when he would have got into those same positions but he would have looked to have passed. Despite conceding twice Kearney was delighted his side kept the Lurgan Blues’ star studded strike force at bay for large chunks of the game. 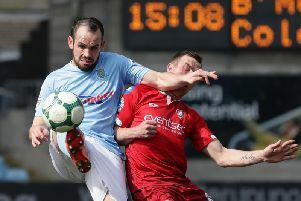 “You have Kevin Braniff, Gary Hamilton and Eoin Bradley, what a strike force and we had to try and manage them and deal with them today.” he said. “I thought we dealt with their threat very well especially when you consider the manner of the goals we conceded today. “We are very disappointed with the first goal, it looked as though Lyndon cleared it off the line, but that’s part and parcel of the game. “That was a soft goal and the second was such a soft penalty, so if you take those two into account it would have been a really harsh way for us to have lost the points. “I thought our performance was really good today we played some good football and looked dangerous going forward. “It’s not nice to have that done to you when you concede so late on in the game, we’ve had it done to us in the past. There was a game against Crusaders were we conceded a late equaliser and it is hard to take, but that’s football and we’ll take it today. “Our form has been brilliant of late. Although we have suffered three defeats in the last eight games but I’d look anyone in the eye and say we have done well. In the games we haven’t won we have played well and created a lot of chances, as we do most weeks. The only disappointment for Kearney was Ogilby’s dismissal and knocks picked up by Darren McCauley and Joe McNeill. “Yeah unfortunately David was sent off for his celebration after the winner,” Kearney said.